Chinook Easy Up-Haul! Join everyone on the US Sailing Team and uphaul with a smile. Take it easy on your back. Everyone who tries it loves it, even beginners. Design has been recently improved. Simple, reliable top loop made of 5mm marine rope. Constructed of heave-duty nylon webbing to endure years of hard use. Length is easy to adjust in seconds, right on the rig. NEW Super-strength velcro closure assures the adjusted length stay secure... nothing can slip or break. Elastic bottom section and bungee loop make the EASY-UPHAUL hug the mast when not in use. 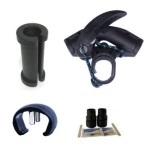 Heavy-duty tubing harness-hook loop as found on the finest harness lines.